Italian physician Maria Montessori was a pioneer of theories in early childhood education, which are implemented in Montessori schools all over the globe. Maria Montessori was born on August 31, 1870, in the provincial town of Chiaravalle, Italy, to middle-class, well- educated parents. The family moved to Rome in 1875 when Maria Montessori was 14. She initially intended to pursue the study of engineering but by the time she graduated in 1890 she decided to study medicine. She studied pediatrics and psychiatry, and worked in the pediatric consulting room and emergency service, becoming an expert in pediatric medicine. She became the first female physician in Italy upon her graduation from medical school in 1896. The relationship with Guisseppe Montesano had developed into a love affair, and in 1898 Maria gave birth to a child, a boy named Mario. Montessori treated many poor and working-class children who attended the free clinics. During that time, she observed that intrinsic intelligence was present in children of all socio-economic backgrounds. In 1900, she began to extensively research early childhood development and education. "Children teach themselves" this simple but profound truth inspired Montessori's lifelong pursuit of educational reform. Her first Casa dei Bambini or ‘Children’s House’, which opened on the 6th January 1907. She put many different activities and other materials into the children’s environment but kept only those that engaged them. Montessori came to realize that children who were placed in an environment where activities were designed to support their natural development had the power to educate themselves. She continued to adapt and refine the materials she had developed earlier, altering or removing exercises which were chosen less frequently by the children. Also based on her observations, Montessori experimented with allowing children free choice of the materials, uninterrupted work, and freedom of movement and activity within the limits set by the environment. Montessori's reputation and work began to spread internationally as well, and around that time she gave up her medical practice to devote more time to her educational work, developing her methods and training teachers. Maria Montessori's first visit to the United States was in 1913. Alexander Graham Bell , Mabel Bell, Thomas Edison and Helen Keller were among her strong American supporters. Montessori's work was widely accepted in different parts of the world including Europe and United States. She travelled and gave numerous teacher training courses. In 1914 she wrote, “I did not invent a method of education, I simply gave some little children a chance to live”. In 1939 Mario and Maria embarked on a journey to India to give a 3-month training course in Madras followed by a lecture tour. Once World War II began, she spent the summer in the rural hill station of Kodai Kanal, and this experience guided her thinking towards the nature of the relationships among all living things, a theme she developed until the end of her life, which became known as cosmic education; an approach for children aged 6 to 12. In 1946 they returned to the Netherlands and developed a program called "Education for Peace". In 1947 Montessori, now 76, addressed UNESCO on the theme ‘Education and Peace’. Her work with the program earned her two Nobel Peace Prize nominations. 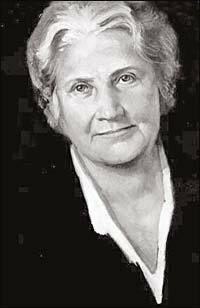 Montessori died on May 6, 1952, in Netherlands. Today, Montessori's teaching methods continue to "follow the child" all over the globe. This method allows children to develop at their own pace and provides educators with a better understanding of child development.